Play Date (5.4% ABV, 8 IBU). 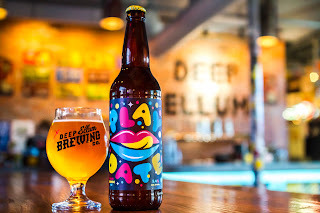 Image courtesy of Deep Ellum Brewing Co. Originally a draft only product unveiled as part of the brewery's 4 Year Anniversary Extravaganza in November, Deep Ellum Brewing Co. today announced the pending wide-release of Play Date. Described by the brewery as "juicy...with notes of sun-kissed fruit, lemon, citrus and melon," Play Date is an American sour ale brewed with Medjool dates. The fruit itself is highly regarded for its nutritional value, and in Middle Eastern culture the Medjool variety is known as the king of dates. As for how the beer came together, brewer Barrett Tillman says, "We start with our iconic Dallas Blonde as the base and ferment it to dryness with Medjool dates; the earthy tea presence of the dates plays well with acidity to create an ale that is truly free-spirited and unique in character. Shy of puckering, the resulting tartness is our homage to an unforgettable first kiss." Tuesday, December 8 at The Bottle Shop in Dallas, from 4-7 p.m.
Thursday, December 10 at The Bearded Monk in Denton, from 6-9 p.m.